Sticks to Any Smooth solid surface. Non Radioactive self-adhesive PET film. Super-mega glow in the dark stuff that can last hours with enough exposure to light. 5 Years life used outdoors. Up to 8 years life when used indoors.. Car shells, heli canopy's, night flying and UFO hoaxes. Clickforsign 1 Inch Glow In The Dark Night Vinyl Safety Tape, 10 feet is a premium quality Warning Tapes from Clickforsign. Moglix is a well-known ecommerce platform for qualitative range of Warning Tapes. All Clickforsign 1 Inch Glow In The Dark Night Vinyl Safety Tape, 10 feet are manufactured by using quality assured material and advanced techniques, which make them up to the standard in this highly challenging field. 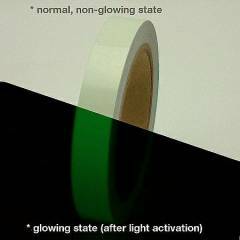 The materials utilized to manufacture Clickforsign 1 Inch Glow In The Dark Night Vinyl Safety Tape, 10 feet, are sourced from the most reliable and official Warning Tapes vendors, chosen after performing detailed market surveys. Thus, Clickforsign products are widely acknowledged in the market for their high quality. We are dedicatedly involved in providing an excellent quality array of Clickforsign Warning Tapes.